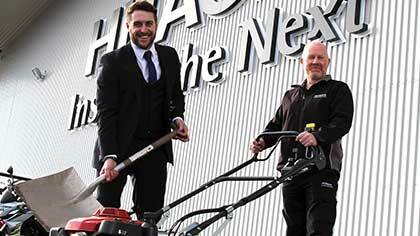 A family-run grounds maintenance and landscaping company has landed a high-profile contract with train manufacturing firm Hitachi Rail Europe. Hitachi Rail has agreed a deal with neighbouring Beaumont Grounds Maintenance to look after its 42,700sqm site on Aycliffe Business Park. Beaumont is now charged with the upkeep of the Hitachi rail vehicle manufacturing facility, which was officially opened by David Cameron in September 2015. The deal comes just a few months after Beaumont celebrated another record year which saw an increase in workforce and turnover. Managing director Alexander Lineton said: “This is another significant deal for Beaumont and naturally we’re absolutely delighted to be working with one of Aycliffe Business Park’s flagship companies. “It comes off the back of a number of notable contract wins for us so business is good for us right now – we’re certainly heading in the right direction. Lineton says Beaumont is now aiming to create more new jobs in 2017. He added: “We’re looking to continue the growth path that we’re on while maintaining the family values that we offer. “We’re aiming to bring in new members of staff in 2017 and deepen the management structure of the business. “We’ve also completed full accreditation for three ISO integrated management systems, including ISO 9001 (quality management framework), ISO 14001 (environmental management practises) and ISO 18001 (Occupational Health and Safety Management). “This is the culmination of many months and years’ hard work and endeavour to gain accreditation which will enable us to push us into new fields and win new large-scale tenders to support our ambitious growth plan. Beaumont’s latest deal is another example of Hitachi’s policy to utilise the local supply chain as much as possible. The firm’s maintenance and facilities manager Chris Evans said: “We’re delighted to be working with Beaumont, who are now in charge of the upkeep of grass, trees, shrubs, weeding and anything that just keeps the site looking world class. Earlier this year, Beaumont reported a 20% hike in turnover to £625,000 figures after the firm had enjoyed a 36% hike on the previous year. Beaumont, which specialises in grounds and sports pitch maintenance, also added four new members of staff to its team in 2016, boosting numbers to 15. Beaumont was established in 1965 by Steven Lineton, who ran the new business alongside his garden centre based on Beaumont Hill in Darlington. In 1991 Beaumont moved premises to larger premises on Aycliffe Business Park and has since pushed more into the commercial maintenance sector. It’s now headed up by the third generation of the Lineton family, with Alexander as managing director and his sister Sophie as accounts manager, while their parents – finance director Mark and company secretary Sally – continue to play crucial roles. Beaumont, which in early 2016 was named Service Business of the Year at the annual Aycliffe Business Park “Make Your Mark” awards, invested £120,000 in new machinery during its 50th year in 2015. Beaumont now has a growing list of 150 contracted sites across the whole of the North-East, down to the Yorkshire and Humber areas and across to the Cumbria region. These include a range of public and private sector contracts – various commercial premises including factories, hotels and premises run by national property management companies – as well more than 50 schools around the North-East region. You can find out more about Beaumont Grounds Maintenance at www.beaumontgroundsmaintenance.co.uk or give them a call on 01325 301379.